My husband celebrated his birthday just this past week. After being with this guy for almost 9 years, 4 of which were in marriage, it’s come to a point where it’s hard to figure out what to get him. Plus I didn’t want to break the bank account, so I was resolved to use my talent since he is a huge supporter of my work. I also wanted my toddler to be part of it as well. Since she enjoys art as much as I do (more like, making a mess of it), I’ve decided to have her create the background and I’ll just overlay my hand lettered verse on top of it. Unlike all her other art pieces, there’s no way we would throw this one out or even tuck it away in a box in the basement. I chose a verse that my husband can be inspired by so that he can put it in a place where he can see it daily. 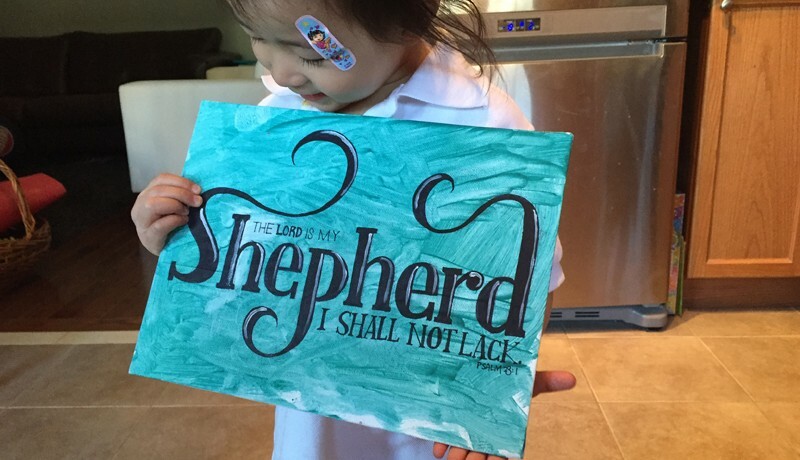 Though I did the lettering while my toddler was sleeping, she recognized instantly that I added to her painting, and she was so happy that I was able to use what she created! I encourage you to try this out with your children’s art! It’ll be fun for both of you and it’ll make a great keepsake! If you are not as well versed in hand lettering, why not sign up for a hand lettering workshop with me and have the opportunity to do one yourself! Or if you are just not going to make that attempt, feel free to contact me at hello [at] ark75.com for a quote on a custom piece! Oh ya, that’s 2 stitches right there above her eye.. after tripping on herself. Sigh. Toddlers.